After two years, I finally mounted and exhibited this piece. 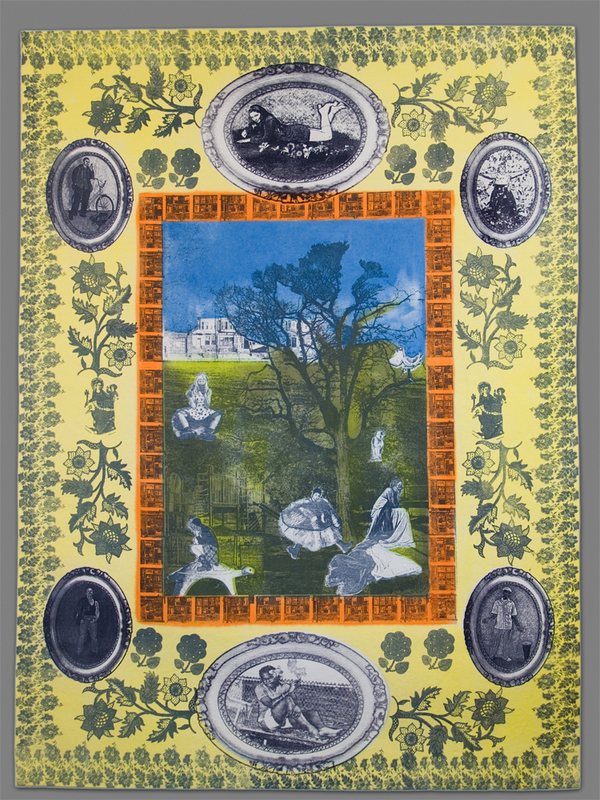 I call it a tapestry because I appropriate the visual format of the Constantine Tapestry, however I have been told not to call it tapestry as it is printed, not woven. So it is my un-tapestry. This was particularly difficult to print – the first phase I laid down the background color then printed 10 screens, some multiple times. 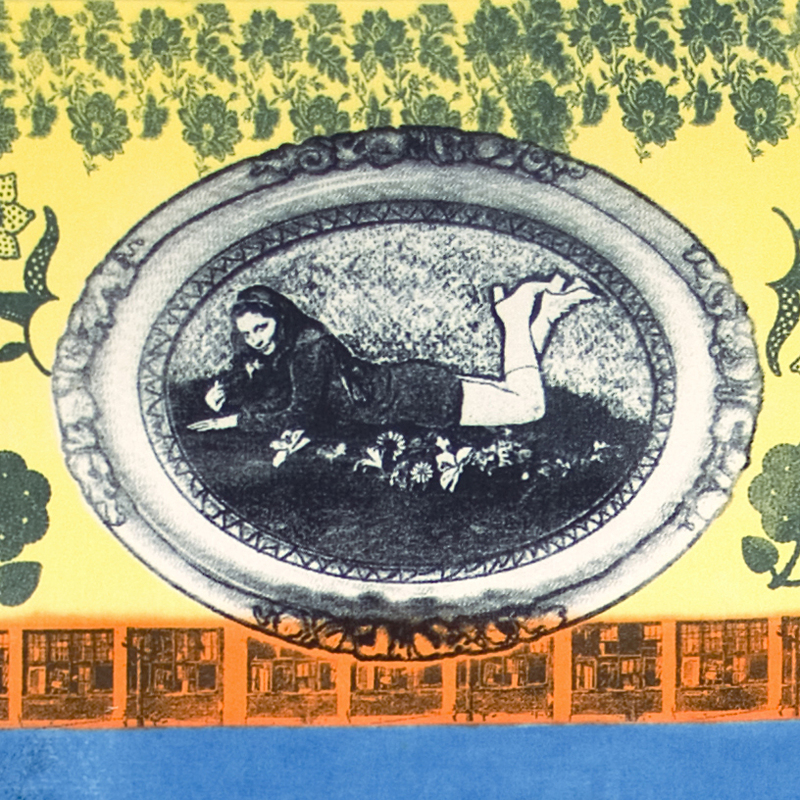 This entry was posted in gender portraiture, modern iconography, musings, new work, textile printing on June 20, 2011 by laureen. The Esther M. Klein Gallery at the University City Science Center is now operating under a program called Breadboard, whose mission is to “convene communities around creative applications of technology.” Hence, the EKG’s latest exhibition, “Machinato Causa,” a collaboration among Breadboard, the Center for Emerging Visual Artists (CFEVA), and NextFab Studio, a technology workshop and prototyping center at the Science Center. The shared project began last summer when Breadboard solicited proposals from CFEVA’s artist members for a six-week residency at NextFab, asking them how such an opportunity might help them to streamline their art-making processes. Artists chosen for the program would be expected to exhibit their NextFab works together at EKG after completing their residencies. 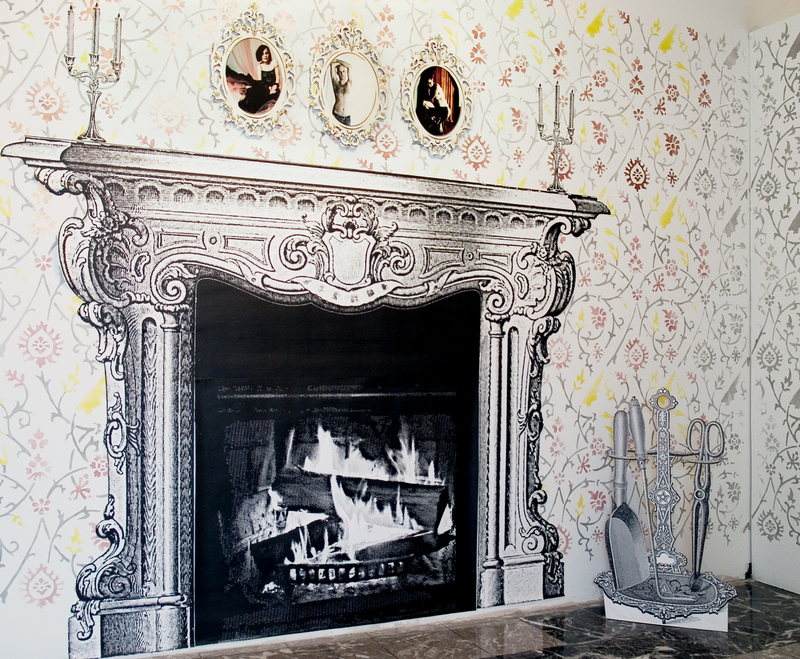 Clearly, Laureen Griffin used quite a few of NextFab’s tools in her installation, “Beauty Revisited: An Ongoing Series of Settings for the Artist’s Gender Portraiture Project,” which includes a room covered with wallpaper of her own design (what appears to be digitally enlarged photographic images of a city street and the parlor of a house) and some furniture, including a lamp with a shade printed with photographic images of butterflies – a contemporary twist on Tiffany. Griffin’s photographic portraits of people of various gender identities seemed not to have been the products of any advanced technologies. The main gallery space was given to Marisha Simons and Peter Hanley, who worked collaboratively on cut-paper forms suspended from the ceiling. I’d like to have known the technology that allowed the lights inside these pieces to dim and brighten and change colors simultaneously, but I appreciated their fragile, alien presence nevertheless. 215-966-6188 or www.breadboardphilly.org. Through Jan. 2. This entry was posted in gender portraiture, lamp design, press on December 16, 2010 by laureen. A place where material culture is re-examined and gender roles are fluid. Installation art by Laureen Griffin and Victorian style miniature theatre by Martina Plag and Leah Walton engage the spirit of nostalgia during a tumultuous time when anarchy, labor struggle, and womenʼs sexual liberation bear equal weight. From the Philadelphia Fringe Festival 2009 at University City Arts League. Funding made possible in part by a grant from the Puffin Foundation and a house party put on by our dear friend Mary Kalyna. This entry was posted in gender portraiture, modern iconography, special events on November 30, 2010 by laureen. It may be the Pittsburgh Center for the Arts, but seven artists from Philadelphia have taken over the first-floor galleries of the center to display their art. Organized by the center’s Adam Welch, their exhibit “Context Ingeminate” is the result of an ongoing annual trading of spaces between the Pittsburgh Filmmakers/Pittsburgh Center for the Arts and the Center for Emerging Visual Artists in Philadelphia. The exhibit features the work of the Philadelphia group’s Career Development Program Fellows: Ana B. Hernandez, Bohyun Yoon, Leslie Atik, Tim Portlock, Maria Anasazi, Laureen Griffin and Allison Kaufman. Their work represents a small cross-section of the 21 artists awarded a career development fellowship, a two-year program that gives participating artists an opportunity to experience a full exhibition schedule, receive career counseling and mentorship, teach in the community and participate in numerous professional development opportunities. Taking up an entire gallery, Yoon’s installation is comprised of hundreds of small, cast-rubber body parts. They create numerous shadows of figures on the walls that seem to dance, thanks to a gyrating light bulb hung directly in the middle of the installation that activates as the visitor approaches. Yoon says the truncated rubber figures, hung like puppets, portray the idea of a group as opposed to an individual. It’s something he relates to his training in military methodology while serving in the Korean army. “As soon as I entered the military in Korea, my superiors tried to brainwash all the new soldiers in regards to who our enemy is, why we have to obey them and so on,” Yoon says. “This training methodology and military law were very well structured and very effectively organized to control new troops.” A light and shadow trick is a key factor in this work. Yoon says it is a metaphor of the invisible power of political tricks he encountered. Kaufman’s “Dancing with Divorced Men,” a six-and-a-half minute, single-channel looped video projection, makes a different, though equally pointed, social commentary. Basically recordings of the twentysomething artist dancing with middle-aged divorced men in their homes, Kaufman says she decided to make the video after a visit to her newly single father’s apartment for the first time. “It’s very strange to visit the home of a newly divorced parent and see what they choose to surround themselves with when they are living on their own for the first time in a long time, or possibly ever,” she says. All of the participants in “Dancing with Divorced Men” were found through online or in-person divorce-support groups. “All strangers to me, I asked the subjects to choose a song and style of dance and, following their lead,” Kaufman says. “I create an appropriate female counterpart from their cues, recording our collaboration.” Experiencing a major change, particularly in mid-life, necessitates forming a new identity to some degree, Kaufman says. “Vulnerability, disappointment and hope, among many other things, are all part of that process and are emotions I’m fascinated with, both in my subjects and myself,” she says. The work is tender, witty and sad, raising questions of how divorced people cope in their personal spaces and in intimate situations. “It’s ultimately about the need for human interaction, the search for it and the insecurities around it, in an increasingly cyber-connected, yet emotionally disconnected world,” Kaufman says. handwritten words and threaded marking tags that become a layering of words, paper and threads that allows for the interplay between text and textile, providing a wonderful warp and weft to the work that gives it a sense of rhythm. Anasazi’s “Crutches” sculpture attempts to address invisible pain—the kind you imagine when you see someone walking down the street on crutches. Although, that may not be obvious at first, given the integration of several books in the work, which the artist says is “a reference to personal history.” Nevertheless, her work contrasts nicely against Portlock’s large-scale digital print of an imaginary cityscape image generated from 3-D special-effects software. It somehow makes this show come full-circle and complete in its own right. This entry was posted in gender portraiture, press, special events on October 16, 2010 by laureen. DEFINE YOUR BEAUTY – Beauty Revisited is an extension of The Gender Portraiture Project bringing together photographic portraits with personal narrative into the context of American material culture and power. I ask participants: “How do you define your own sense of beauty? When you look inside yourself who do you see?” My work confronts society’s displacement of female identity. I am looking to open up possibilities of being. To discover how dominant societal expectations rule our gender. My goal is to have a critical mass of portraits reflecting gender variations and to show how birth, class, family, country of origin and ancestry, personal taste, body type, age and whatever other qualifiers are placed on us affect us. “Gender variations” does not necessarily mean trans, but can also be one’s interpretation of what is feminine or masculine. To think about times when we were awarded or punished in relation to our “appropriate” gender-like behaviors or looks. In my studio, located in Stenton Guild, (4232-36 Stenton Ave, in the Germantown area of Philadelphia, PA), I have set up a portrait photography studio where people come in to talk about gender and have their portraits taken. I invite the public to share personal stories of gender stereotyping and be photographed. You can pose in your street clothes, an outfit from your personal collection, or we can work together to conceive of the ideal costume. Stories told by participants are about being stereotyped. What is appropriate behavior in relation to perceived gender? How should we look? What are the expectations depending on class, ethnic heritage, and family background? Instead of relying on clues relating to dress, one may choose to explore the physical body relating to gender expectations. For many of us attaining the “perfect” body is a symbol for the ultimate gender self. Many struggle with disfiguration and some accentuate what nature gave us. Others make do with what they have. As an artist, I am also looking for people interested in body critique – making commentary on the gender body. Please email the artist, Laureen Griffin, if you are interested in participating. This entry was posted in gender portraiture, gender talk on October 17, 2009 by laureen. Howard Zinn is most well known for his passionate political writing, not his plays. So when I heard he’d written one about Emma Goldman, the renowned anarchist—and that it was being performed at the Fringe—I was intrigued. In collaboration with artist Laureen Griffin, Martina Plag and Leah Walton have put a lush, sensual decoration in the peformance parlour. Using silk-screen printed chairs, old-time props, and a setup much like your grandmother’s living room (if your grandmother was a fierce feminist), the principles have created a visual feast. Griffin, creator of the Gender Portraiture Project, works with her subjects to explore issues of gender, ethnicity, class, and sexuality, and the carefully curated portraits that adorn the walls are vibrant and arresting. They offer a thoughtful counterpoint to the center stage puppet theatre, which includes the smallest details on paper dolls and painted backdrops finely and exquisitely rendered. During the play itself, Plag and Walton’s quirky, interpretive spin takes the audience on a curious romp, with a few surprises. Two pops of a cap gun had the audience jumping in their seats, and words literally unscroll from Emma’s mouth on occasion during her speeches. Symbolism abounds (a birdcage does double duty as a jail). The actors transition smoothly between their puppet manipulation and more traditional acting roles. Emma’s story is a powerful and timely one—she spoke about issues of love, war, patriotism, democracy, and freedom of speech while wrestling with the tension between pleasure and duty that comes with being an activist—and the visuals compelling, so it seems unfortunate that the play itself, for all its outward beauty and clever ideas, falls a little short of its grand vision. The script seems more of a historical recounting of Emma’s life, and we only receive flashing glimpses of the woman behind the rhetoric. A meandering second half only adds to the disconnect. I found myself agreeing with Goldman’s thoughts that “there has to be a little beauty in the midst of struggle,” and in that regard, the play designers have conceptualized her ideas quite proudly. I just wish the play’s words had matched the visual power of their performance space. Festival Rating: Go for the art, stay for the play. This entry was posted in gender portraiture, modern iconography, press, special events on September 16, 2009 by laureen. Please come check out EMMA’s Parlour in University City Arts League – Meet the artists during our Opening Reception, Friday Sept. 11th, 5-7PM or email Laureen for information about having your Gender Portrait taken in the Parlour. 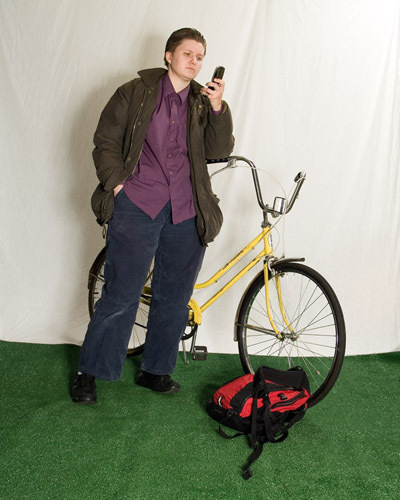 This entry was posted in gender portraiture, special events on September 7, 2009 by laureen. This entry was posted in gender portraiture on August 6, 2009 by laureen. This entry was posted in gender portraiture on November 20, 2007 by laureen. This entry was posted in gender portraiture on October 24, 2007 by laureen.